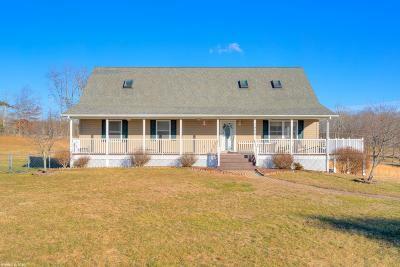 Large Cape Cod on 1.6 acres, in McCoy - outdoor enthusiasts will enjoy the large rural lot, and the proximity to the New River. Long-range views from this beautiful home, including the covered front porch and side deck. A large open floor plan on the main accommodates everyone easily, and encourages conversation. Two bedrooms on the main level, including a master en suite with large bathroom, garden tub, and walk-in closet. Upstairs find a large den/flex-space overlooking the mountains, a large third bedroom, and full bath. The finished downstairs offers a fourth bedroom and bath, as well as rec room, access to the two-car garage, and walkout to the backyard. Plenty of storage throughout, with options on all three levels. Home is in great condition and ready for new owners. Directions: Prices Fork To McCoy. Seymour Will Be On Your Right Just Past The Longshop-McCoy Volunteer Fire And Rescue Station.